HOAL: Science Questions – How can Small Scale Soil Moisture Variability be Related to the Response of Satellite Sensors? Science Questions – How can Small Scale Soil Moisture Variability be Related to the Response of Satellite Sensors? Understanding the controls of spatial soil moisture patterns in small catchments is essential for upscaling soil moisture from point to catchment scales as needed for drought predictions. The relative importance of the factors driving the spatial distribution of soil moisture will change during the season, e.g. topography may control the soil moisture distribution during wet periods, and vegetation and soil properties may be more dominant during dry conditions, which will affect the way satellite sensors see the soil moisture. 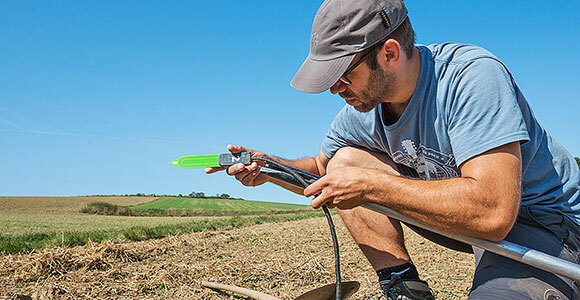 A soil moisture network of more than 30 stations within the catchment was set up that uses wireless transmission technology. Time Domain Transmission sensors are used which measure the dielectric conductivity from the propagation velocity of an electromagnetic wave. Scaling analyses are conducted to relate the soil moisture variability to a larger landscape context. There is a close interaction with the transpiration and flood generation analyses.